A Florida inmate helped rescue a baby locked inside a vehicle on Valentine's Day by using a coat hanger and his "skill set." 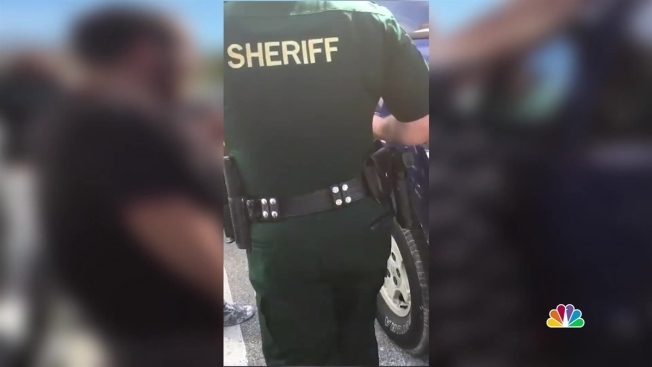 The Pasco County Sheriff's Office said deputies received the report of an infant locked inside an SUV at a New Port Richey courthouse on Thursday. "Upon arrival, it was 56 degrees outside and the baby was in a car seat and appeared to be comfortable," the sheriff's office said in a statement. "Several minutes went by as the parents could not enter the SUV successfully." The parents told officers they could not afford a locksmith. The father then told deputies he was going to break the window on the driver's side. Before the window was smashed, however, a Pasco County Sheriff’s Office inmate supervisor and five low-risk offenders repairing a parking lot median nearby at the West Pasco Judicial Center offered to help. The father and other inmates helped pry open the door just enough for the inmate to use the coat hanger to push the electronic unlock button on the door. Pasco County Sheriff Chris Nocco praised the inmates who helped free the infant and save the family from a window repair bill. "Our trustees are people who have made mistakes, we're trying to rehabilitate them to get back into society," Nocco told NBC 2 News. "A lot of them, like these individuals, they know they made bad mistakes, bad choices, but they want to do the right thing in life." Nocco said the inmate's "skill set" came in handy, though he jokingly added that "only when a deputy is around and we give permission can you break into" a vehicle. The infant's mother, Shadow Lantry, captured the incident on video. "This is hilarious," an officer is heard saying in the video before apologizing for the situation. "It's not funny about the baby but everything else is hilarious," Lantry says.